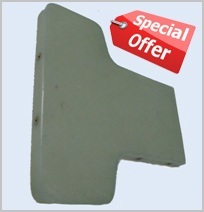 Aerodynamic wingtip skids, originally of Schneider LS type gliders (LS4, LS6, LS3, LS8) are made of two component very durable polymer PUR. The valve have two interlocking pistons with seals. It is made and completed according the drawing 1BF-114e.